The year 2005 marks the 100th anniversary of Albert Einstein's "miraculous year" in which he published three papers describing ideas that have since influenced all of modern physics. In 1905 Einstein wrote three fundamental papers, all in a few months. The first paper claimed that light must sometimes behave like a stream of particles with discrete energies, "quanta." The second paper offered an experimental test for the theory of heat. The third paper addressed a central puzzle for physicists of the day - the connection between electromagnetic theory and ordinary motion - and solved it using the "principle of relativity." 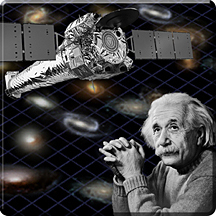 Einstein's fingerprints can be found on virtually every scientific result obtained with Chandra X-ray Observatory data. These results in turn have expanded our concept of the Universe far beyond what was imagined at the beginning of the 20th century. Three of Einstein's discoveries - the photoelectric effect, the theory of special relativity, and the theory of general relativity (published in 1915) - are described below, with examples of how his work is used extensively by X-ray astronomers. It is well known that Einstein's work on relativity transformed the landscape of physics, but it is not generally appreciated that he received the Nobel prize for his work on the photoelectric effect. His prizewinning work showed that the emission of electrons from a substance when high-energy light strikes it can be explained if light is composed of photons that behave like particles. The operation of Chandra and the interpretation of the data gathered by Chandra would be impossible without an understanding of the photoelectric effect. Chandra's two X-ray detectors make use of the ejection of electrons from atoms by X-rays via the photoelectric effect. This process is also responsible for the absorption of X-rays by the Earth's atmosphere, which is why Chandra has to be in space in the first place. The role of the photoelectric effect in X-ray astronomy is crucial. Almost every spectrum of an X-ray source that Chandra makes shows evidence of the photoelectric absorption of X-rays either by atoms in interstellar space between the source and Chandra, or by atoms and ions clumped around a cosmic source, such as a cloud of cool gas around a young star, or an accreting black hole. This effect allows astrophysicists to determine the amount and composition of cool gas and dust in space, and to trace the motion of iron atoms orbiting very near black holes. The theory of special relativity implies that: time passes at different rates for reference frames in relative motion; that radiation from electrons moving at near the speed of light is highly beamed and boosted in energy; and that matter-antimatter pairs of electrons can be created from very high-energy photons. These effects are needed to interpret the light observed from pulsars, gamma ray bursts, and from X-ray jets that originate near supermassive black holes and extend over hundreds of thousands of light years. The theory of general relativity implies that mass curves space which in turn implies the existence of black holes. Many of the powerful X-ray sources observed by Chandra are thought to be due to X-radiation from gas that is heated to millions of degrees as it swirls toward black holes. The theory of general relativity is used together with X-ray observations to determine how much gas is falling into these black holes, and to set limits on their masses. A careful study of the X-rays from gas falling toward black holes may ultimately test the predictions of general relativity. Already, Chandra observations have provided evidence for the dragging of space around black holes, and for the existence of event horizons. Another consequence of the bending of space by matter is the bending of light, which causes massive galaxies and galaxy clusters to act like gravitational lenses. This phenomenon has enabled scientists using Chandra to study distant quasars, and, through comparison with optical observations, to probe the conditions in gas clouds around black holes with unprecedented accuracy. Finally, general relativity is the fundamental theory needed to understand the evolution of the Universe. Chandra observations of distant clusters of galaxies enable astronomers to inventory the amount of dark matter and dark energy, the two dominant components of mass and energy in the Universe.